As the technology advances, the number of applications of Bluetooth technology increases. The Bluetooth gets built into everything these days and some applications can be really crazy. We already have Bluetooth toasters, bicycle handlebars, smoke detectors (which is not so crazy), thermometers, refrigerators, even forks. Yes, there’s a Bluetooth fork. Having that in mind, Bluetooth light bulb speakers don’t seem crazy at all. The idea of combining lights with music is not a new one. It’s been here since the disco era and the introduction of new technologies (Bluetooth, LED lights, more durable rechargeable batteries) enabled easier integration. Bluetooth speakers with built-in LED lights and smart Bluetooth light bulbs appeared first and the next step was to build a speaker into a Bluetooth LED light bulb. This is probably not the smartest or the most useful Bluetooth application but it’s an interesting one and it can be really fun. 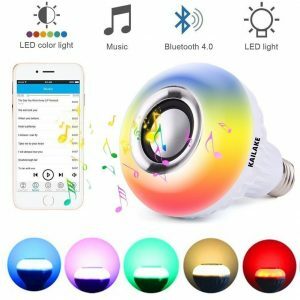 Our article on 15 best Bluetooth light bulb speakers is designed to give you all the necessary info on Bluetooth light bulb speakers. 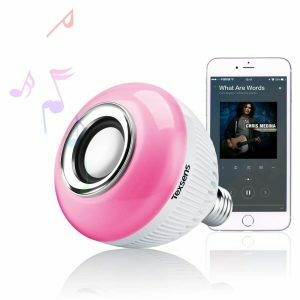 We are going to discuss their advantages and warn you about disadvantages, tell you what to expect and what to look for when buying light bulb speakers, and give you a short buying guide where all the important things you should pay attention to when buying Bluetooth lightbulb speakers are listed. We have also made a selection of 15 best Bluetooth light bulb speakers. Take a look and find the best one for you. There are many advantages and only a few disadvantages of Bluetooth light bulb speakers but they can still be a huge deal breaker if you don’t know what to expect. That’s why you have the next two sections. Read them carefully and try to base your expectations on those advantages and disadvantages. Speakers are by default built into LED light bulbs and, as you already know, LED light bulbs are much more energy-efficient than regular light bulbs. Bluetooth LED light bulbs consume more energy than regular LED light bulbs, and if there is a built-in speaker, the power consumption gets even greater. Even with these additional costs, Bluetooth LED light bulb speakers are much more energy and cost efficient than regular (incandescent) light bulbs. So, if you are still using regular light bulbs, you will add some nice additional features to your light bulbs and cut down your electricity bill at the same time. If you have already switched to LED lights, the electricity bill won’t be increased significantly. Every Bluetooth (smart) LED light can be controlled with your phone. There’s always some kind of app that you can download from the AppStore or Google Store and use it to control the color of the lights and brightness. Some Bluetooth LED light bulb Speakers are also controlled through the app. You will be able to adjust the volume or even set the sleep and wake-up timers. Other Bluetooth light bulb speakers can’t be controlled with your phone but they come with a remote and you can use that remote to control the lights or the playback. This one is closely related to the previous advantage. Most of the Bluetooth light bulbs can be dimmed and Bluetooth light bulb speakers are not an exception. You don’t have to install dimmer switches to dim the lights, now. You just need that Bluetooth LED light bulb and use your phone or the remote to dim the lights. Press another button, play the music and create a nice romantic atmosphere in a second. And that’s not all. You can also change the color of the light or synchronize the lights with the music and make a nice light show. This one is pretty obvious. If there’s a speaker built into some device, it will play music. What’s so special about it is the fact that you can combine the music with different colors and set the mood. 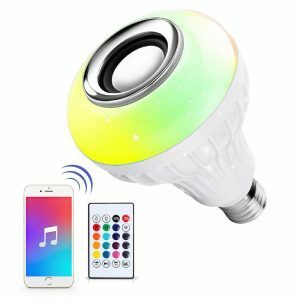 There are no many disadvantages of Bluetooth light bulb speakers but there is one critical thing that you have to be aware of – light bulbs are small which means that the speakers built into light bulbs are also small. Small speakers tend to sound tiny and there’s no way to change that. There are light bulb speakers with 1W, 3W, and 5W drivers and if you want just a little bit more quality and loudness, you should pick the ones with larger drivers. Still, you have to pay attention to the light bulb body size (larger driver means larger light bulb and they can be too large for your lamp). The most important thing you have to know is that a light bulb speaker cannot be used as your main speaker. They can play some nice background music and can be used for some non-critical listening and that’s all. They will never be able to replace your stereo system. Sound delays are common for most of the Bluetooth speakers (unless they support aptX Bluetooth profile). Sound delays are inevitable when it comes to Bluetooth speakers and you can’t use these speakers if you want to watch a video. The other issue you may experience is also related to the Bluetooth connection capacity. The Bluetooth connection is not capable of transmitting audio signal without compression and when you try to use Bluetooth for something else while playing music, you may experience short signal loss (cut out). So, if you try to adjust the brightness, change the color of the light, or make a light show while playing some music, you may experience signal loss. The previous two sections were supposed to set your expectations (and maybe to lower your expectations regarding sound quality). So, you can expect a long-lasting LED light bulb with 5,000-50,000 hours lifespan (1-5 years). Along with great durability, you will get some additional features – you will be able to dim the lights, change the color of the lights, make a light show, synchronize the light show with the music, set sleep and wake-up alarms, play the music and get a decent sound quality and loudness (but there will be nothing truly amazing about the sound). The cheapest Bluetooth light bulb speaker on this list costs less than $10 and the upper limit when it comes to price per one speaker is $50. So, we can say that Bluetooth light bulb speakers are usually affordable (and some of them are really cheap). 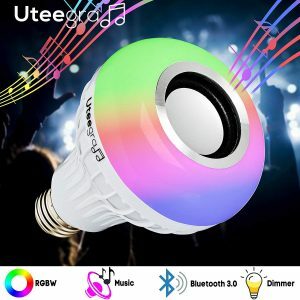 When buying Bluetooth light bulb speakers, you should be paying attention to the light bulb size and screw base size, Bluetooth connection quality, compatibility, different additional features, and sound quality. We will discuss all these parameters at the end of this article and now, we are going to present our list to you. This is our selection of 15 best Bluetooth light bulb speakers in 2019. Luditek 030 light bulb speaker comes in a simple and small cardboard box. Along with the speaker, you will get the 24-button remote and user manual. The LED light bulb has the output power of 6W and there’s the 3W speaker (somehow, that’s 12W combined and not 9W). The light bulb speaker has E27 light bulb screw base and it can be used with regular E26 or E27 sockets. The light bulb is 5.5 inches long and its diameter is 3.6 inches. The speaker’s frequency response spans from 135Hz to 15KHz (which means no low-end and poor treble). Luditek 030 looks like any other light bulb. The speaker is at the bottom. The lightbulb is made of plastic and it seems quite durable. The manufacturer claims that the light bulb has a lifespan of 50,000 hours which is quite amazing considering the price (almost impossible). You can choose one of 13 colors (12 RGB colors + white). We don’t know what’s the color temperature but the white light is kind of yellowish, so it’s less than 3,000K (warm white). If you want clean white (3,000K) or natural white (4,000K) this is not the best choice for you and it can’t be any whiter. You can also choose one of four lighting modes – flash, strobe, fade, flicker. The remote that comes with the Luditek 030 is not perfect but it’s the only way of controlling the lights. You can use it to adjust the brightness, change the color of the lights, turn on or off the light, or pick the lighting mode (flash, strobe, fade, smooth). You can also use the remote to control the playback (play, pause, next/previous song) or to adjust the volume. The Luditek 030 features Bluetooth 3.0 which is not the best choice when it comes to Bluetooth version but it’s decent. You will get almost 30 ft of range without obstacles. The pairing process is simple and quick and we haven’t experienced any issues regarding the connection quality. Sound quality is not amazing. The sound is tiny and there is practically no low-end. The treble is kind of dull. This speaker is mid-centric and it’s a good choice if you need something for non-critical or casual listening to music. There is no app that you can use to control the lights or the playback. You can control the playback with your phone or with the remote. If you want to change the color of the lights, you have to use the remote. The speaker makes a beeping sound when you turn it on or off and it can be quite annoying. It appears only when you press the light switch. It doesn’t appear when you turn off the light bulb with your remote. The remote buttons are quite unresponsive. You will have to press one button multiple times to perform the desired action. Also, some buttons don’t do what they are supposed to. For example, if you press one lighting mode button, you will activate some other lighting mode. Based on other reviews we’ve read, this is not an issue with all the remotes. Ours was probably defective. You can control multiple light bulbs simultaneously but you will be able to control the lights and not the music. If you have two light bulb speakers, you won’t be able to pair them with your phone simultaneously and use them as left and right channels (and you can’t group multiple light bulbs and stream the music from the same source device to all of them at the same time) but you will be able to activate the same lighting mode on both light bulbs with one remote. Lightme LM62 is very similar to the previous one (Luditek 030). In fact, many light bulb speakers look alike and some are absolutely identical. It’s almost like there is only one factory making all the light bulb speakers and selling them under a different name in order to create an illusion of choice. There are two small things that make LM62 different from Luditek 030. LM62 is slightly larger and it produces a slightly brighter light. They are practically the same in all the other aspects. LM62 is actually quite cheap and it’s not impressive in any way but it does what is supposed to do and for the price, we can’t really ask for more. The light bulb comes in a cheap-looking cardboard box with all the technical specs listed on it. Along with the speaker, you will get an IR remote (looks almost the same as the Luditek 030 remote but you can’t use it to control the playback) and user manual. The combined power output of the LED light bulb and the speaker is 12W (6W white LED light + 3W RGB + 3W speaker). The package weighs 9.1 ounces, the light bulb’s diameter is 3.74 inches and it’s 5.31 inches tall. The light bulb has an E27 screw base and it can be used with E26 and E27 sockets. E26 is the most common socket in the US but the problem could be the size of the body. The lightbulb is quite large and it might not fit all the floor and table lamps in your home (you should check the size of the lampshade and compare it to the size of the light bulb). The frequency response of the speaker spans from 135Hz to 15KHz. Just like Luditek 030, LM62 looks like a regular light bulb. You should know that only the bottom end of the light bulb is illuminated (unlike regular LED light bulb) and that the speaker is also on the bottom. The light bulb speaker’s shell is made from plastic and it looks like any other. The estimated lifespan of the light bulb is 50,000 hours which is an equivalent of 5 years (we can’t check if this is true but if it is, it’s more than amazing). The speaker is not that impressive and we don’t think that it could last for 5 years. When it comes to colors, you can choose one of 15 different RGB colors + white. The lights are not too bright but they are brighter than the lights on Luditek 030. Color temperature is around 3,000K (clean white). You can choose between 4 color modes – flash, strobe, soft, and smooth. The remote that comes with the LM62 is the only way of controlling the lights. 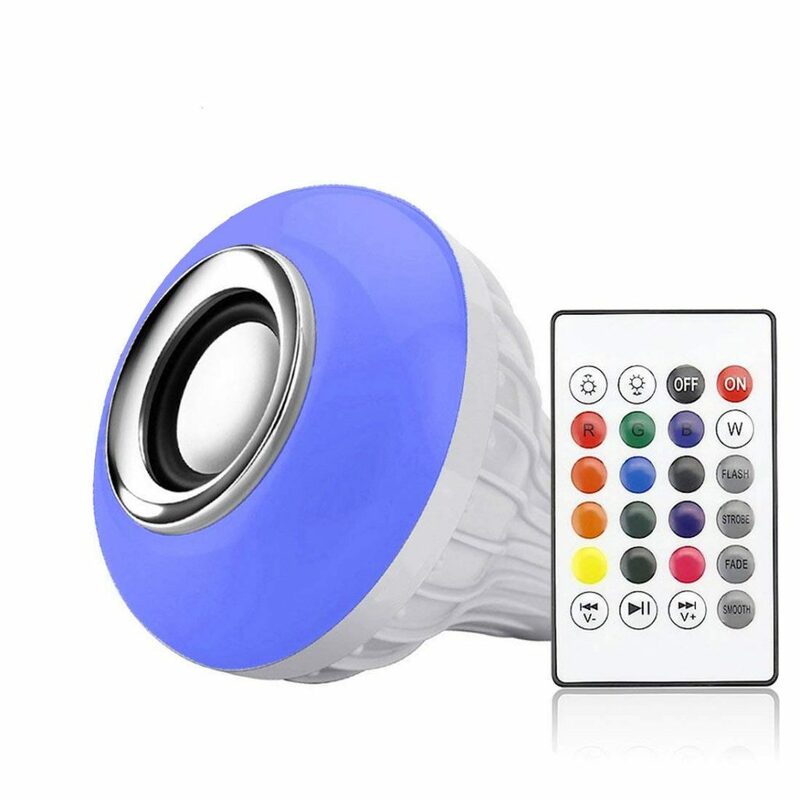 You can use it to turn them on/off, adjust the brightness, choose one of 16 colors and one of 4 lighting modes. The remote is responsive. We haven’t experienced any of the issues we’ve had with Luditek 030. The speaker features Bluetooth 3.0. Pairing takes a few seconds and Bluetooth range is around 30ft. Nothing wrong about the Bluetooth. The bad thing is that you can’t pair your phone with two or more LM62 light bulb speakers and use them for stereo playback (but you can control multiple light bulbs with one remote). The sound is tiny and unimpressive. The emphasis is on the mid tones. The sound gets distorted even at 70% volume (especially if there is too much bass in your music) so you should try to leave it at 50% if you can. LM62 might not fit all the overhead sockets and lamps. The reason is not the screw base size (it’s E27 so it’s compatible with the E26 socket which is the most common one) but the size of the body of the light bulb. The light bulb can be controlled with the remote but there is no app and by today’s standards, that’s a drawback. AVX Audio light bulb speaker looks like the previous two and the only way to make a difference is to look for the logo on the side. Still, this light bulb speaker is different from others in some aspects. First of all, it has a much shorter lifespan (approx. 3,000 hours which made us wonder if those first two light bulb speakers could really last for 50,000 hours). The second difference between Uteegra and the previous two is the screw base size. The previous two were E27 and this features E26 screw base but that’s not a big difference since E26 and E27 are interchangeable. In all the other aspects, all three light bulb speakers are very similar (price, size and shape, power, remote, lights, functions, Bluetooth, etc.). The speaker comes in a nice little box along with user manual and remote (the remote looks exactly the same as Luditek’s remote but it works better and it’s more responsive). The combined power output is 12W (6W for white light, 3W for RGB lights, and 3W for the speaker). The light bulb features E26 screw base and it can be used with E26 light bulb socket which is the most common one in the US. You might find it too large to fit your lamp if the lampshade is too small. You should check the size of your lampshade and compare it to the size of the light bulb speaker. The light bulb’s diameter is 3.6 inches and it’s 5.5 inches long (the same as Luditek 030). The frequency response is the same as it was in those two previous reviews (135Hz to 15kHz). The light bulb speaker looks just like any light bulb and you would know that it is different by the Uteegra logo on the side. The speaker is located at the bottom. Like the previous two, Uteegra is made from plastic. The lifespan info is kind of confusing. The estimated lifespan of Uteegra light bulb is 3,000 hours which is much shorter than the lifespan of the previous two light bulb speaker. 50,000 hours seems really unrealistic when you know that all three light bulb speakers are within the same price range ($10 to $15). So, 50,000 hours has to be a false advertisement (but if it’s true, then it’s really amazing). With Uteegra you can choose one of 12 RGB colors + white. The color temperature varies from 3,000K to 6,500K depending on your brightness settings. The remote looks exactly the same as Luditek 030 remote. You have color buttons, 2 brightness buttons, ON/OFF buttons, 4 mode buttons (fade, flash, strobe, and smooth), and three buttons that you can use to control the playback (play/pause/next song/previous song) or adjust the volume. The speaker features Bluetooth 3.0 with a 20ft range. The pairing is simple and quick. The sound quality is not impressive. There is no bass and no high-end. Distortion appears at 80% volume or even sooner if you play some bass-heavy music. For the size and price, it offers decent performance. There is no app that you can download, install, and use to control the lights. If you want to change the color of the lights, adjust the brightness, or change the mode, you have to use the remote. If you want to control the playback, you can use your phone or the remote. Uteegra light bulb speaker is larger than a regular light bulb and it might not fit every lamp, especially if the lampshade is narrow. You can’t pair two Uteegra light bulb speakers with one phone and use them as left and right stereo channels. You can control the lights on multiple light bulbs with one remote but you can’t stream music to multiple light bulb speakers simultaneously with one phone. ICOCO is a little bit different than the previous three but there are still more similarities than differences. This light bulb speaker has an aluminum mesh covering one part of the light bulb’s shell. The speaker on ICOCO is located closer to the screw base. The only illuminated part of the light bulb is the bottom. This is where the story on differences ends. In all the other aspects, the first four light bulb speakers are the same. ICOCO is just a little bit pricier ($15-$20 price range) but it’s still affordable. ICOCO light bulb speaker comes in a nice little box along with user manual and remote (this remote looks absolutely the same as Luditek’s but it’s more responsive and easier to use). The light bulb speaker features a standard E27 screw base but the body is larger than the body of a regular LED light bulb. Its diameter is 3.15 inches, and its length is 5.63 inches. The size can be a problem if your lampshade is too small. Check the size of lampshade before buying this light bulb speaker. The combined power output of the light bulb speaker is 12W – 6W (White) +3W (RGB) + 3W (speaker). Just like all the previous speakers, the frequency response of this one spans from 135Hz to 15kHz. The light bulb looks a bit more stylish than the previous three because of that aluminum grille but other than that, it looks like an enlarged LED light bulb. ICOCO is made of plastic and aluminum. It looks quite durable and sturdy and the driver looks more protected than drivers on the previous three speakers. The manufacturer doesn’t offer any info on the light bulb lifespan but you can probably expect at least 3,000 hours. Like with Luditek or AVX Audio Uteegra, you get to choose between 12 RGB colors + white. Brightness is adjustable and you have four lighting modes – strobe, fade, flash, smooth. The white light is quite bright (color temperature is probably around 4,000K but we can’t confirm that since there is no info on color temperature). ICOCO uses Bluetooth 3.0 with a standard Bluetooth range (approx. 30ft) and simple pairing process. The sound is tiny and weak but the speaker is very loud for its size. The sound gets distorted and muffled at high volumes but if you don’t crank it up, you’ll get a nice background music. There is no app that you can use to control the lights – you have to use the remote to control them. You can use your phone to control the playback but you can also use your remote for that. This speaker would be so much nicer if there was an app. The light bulb speaker is bigger than the regular LED light bulb (the body, not the light bulb screw base) and you should check if it can fit your lamp before buying it. You can’t link two or more ICOCO light bulb speakers together and stream the music to multiple light bulb speakers at the same time. You cannot pair two speakers with your phone and use them as left and right channels but you can control the lights on multiple ICOCO light bulb speakers with one remote. RAYWAY light bulb speaker has a different shape and size than the previous speakers but it’s not really different than others when it comes to technical specifications. So, we have another light bulb speaker that looks like it’s made in the same factory. Just like the others, RAYWAY light bulb speaker comes in a small box along with user manual and recognizable remote (looks like most of the other remotes). As we have already said, this speaker is shaped differently. Its diameter is 3.54 inches, and it is 4.72 inches long. So, it’s shorter than other speakers. RAYWAY features E26 screw base and it’s compatible with most of the light bulb sockets since E26 is the most common base. There is one 2-inch driver inside the speaker. The speaker’s power output is 3W and the combined output power of the RAYWAY light bulb speaker is 12W (6W white light + 3W RGB lights + 3W speaker). Just like all the previous speakers, RAYWAY has a frequency response that spans from 135Hz to 15kHz. RAYWAY looks quite interesting and kind of chubby (if you can say that a light bulb looks chubby). The speaker is at the bottom and there is a small illuminated ring around the speaker. The RAYWAY is quite durable and when we say durable we are talking about the lifespan of the light bulb. The estimated lifespan is 20,000 hours (approx. 2 years). The speaker itself doesn’t look equally durable but it’s probably strong enough to withstand two years of use. You can choose one of 15 RGB colors + white. White is pretty bright (no info on color temperature but it’s probably higher than 4,000K). You can also choose between 4 lighting modes – flash, strobe, fade, and smooth. You will also get the remote that you can use to pick the color of the light, pick the lighting mode, turn the light on/off, or adjust the brightness. You can’t use the remote to control the playback. You will have to use your phone or some other Bluetooth-enabled device. The speaker features Bluetooth 3.0. The range is, as always, 30ft without obstacles. The pairing is quick and we haven’t experienced any issues. Sound quality would not be satisfying if this is some other type of speaker or if it was more expensive. For that kind of price and size you can’t expect great sound and since this is a light bulb speaker it doesn’t get much better than that and we are satisfied. The bass doesn’t exist, the highs are dull, and mids are articulate. The sound gets distorted at high volumes (above 80%). The app is not included and you cannot control the lights with your phone. You have to use the remote to control the lights. Also, you can’t control the playback and volume with the remote, only with your phone. You can’t pair one phone with two light bulb speakers and use them as left and right channels but you can control the color and brightness of the lights on two or more RAYWAY speakers with one remote. Also, you can’t link multiple light bulb speakers together and stream the music from one device to all the speakers simultaneously. Ustellar is just another light bulb speaker that looks exactly the same as a regular light bulb. The speaker is at the bottom. When it comes to sound quality, it’s neither better nor worse than previously mentioned speakers since they all have 3W speakers. It’s a bit more expensive than others because of slightly higher color temperature and dancing light feature (you can sync the lights with the music). The speaker comes in the same box as the Lightme speaker that we’ve already reviewed which proves our assumption that most of these speakers are made by the same Chinese company. Like always, you will find three things inside the box – Ustellar light bulb speaker, user manual, and remote. There is no app that you can use to control the speaker or lights and you will have to use the remote if you want to change the lighting mode or color of the lights. The diameter of the light bulb is 3.74 inches and it’s 5.28 inches long. It has E26 screw base so it will fit most of your light bulb sockets. The total output power of the light bulb is 12W (6W white light + 3W RGB lights + 3W speaker). The frequency response of this one is the same as the frequency response of other speakers (135Hz to 15kHz). Ustellar looks like many other light bulb speakers on this list and on the market. The bottom part of the light bulb is illuminated (not the whole light bulb). Speaker is located at the bottom. The light bulb speaker seems well-built and quite durable. The estimated lifespan of the light bulb is 50,000 hours (at least 5 years) which is quite amazing but there is no way to confirm that. You can choose one of 12 RGB colors + white. The white light is really bright (color temperature is 5,000K). There are three color modes – flash, strobe, and fade. There’s also the dancing light button on the remote. You can use it to sync the lights with the music and make a nice light show. There are three additional buttons on the remote that you can use to control the playback or to adjust the volume. The speaker uses Bluetooth 3.0. The pairing process is simple and it will take up to 10 seconds. The range is shorter than 30ft (approx. 20-25ft). The sound is tiny and shallow. The bass is not really there while the highs are kind of lifeless. The mids are probably the best thing and they are articulate. The speaker can be quite loud but the sound gets muffled at high volumes. This light bulb speaker is a nice choice if you need some quiet background music followed by a nice lighting. The app is not included and you have to use the remote to control the lights or activate some lighting mode. You can use either your phone or the remote to play/pause, skip/play the previous song, or adjust the volume. Like all the other light bulb speakers, Ustellar is slightly bigger than a regular LED light bulb and it may not fit your lamp (not because of the screw base but because of the body of the light bulb). You can’t pair two or more speakers with one phone (or some other Bluetooth-enabled device) but you can control multiple light bulbs with one remote. The remote is inconsistent and unresponsive. KAILAKE light bulb speaker, just like all the previous speakers, looks like a regular light bulb with a speaker at the bottom. There’s nothing really special or different about it, so we are going to be fast. The speaker comes in a small box. You will also get the user manual and the remote. The app for controlling the speaker is not included and you have to use the remote to control the lights and playback. The diameter of the KAILAKE light bulb speaker is 3.7 inches and it’s 5.6 inches long. As always, the size of the light bulb can be a problem if your lampshade is not large enough. The light bulb features E27 screw base and it can fit the E26 light bulb socket which is the most common socket size in the US. The speaker’s total power output is 13W (7W white light, 3W RGB lights, 3W speaker). The frequency response spans from 135Hz to 15kHZ. KAILAKE, just like many speakers on this list, have a driver at the bottom and a small illuminated ring around the speaker. It’s made of plastic and it looks sturdy enough. The estimated lifespan is 50,000 hours which is excellent if it’s true (and we doubt it). You can use the remote to choose one of 12 RGB colors + white (5,000K color temperature). You also have four available lighting modes (strobe, smooth, fade, and flash). The remote features on/off buttons (you can use them to turn on/off the lights but not the speaker), as well as two brightness buttons. If you want, you can use the remote to control the playback (play/pause/skip) or to adjust the volume. KAILAKE features Bluetooth 3.0 with a 20ft range. It can be paired with any of your Bluetooth devices and the pairing process is fast. We are not happy about the connection quality – there were occasional signal dropouts. Still, the signal strength and connection quality are decent for the price. Just like other similar speakers, KAILAKE delivers tiny and shallow sound. The bass is weak, really high frequencies are not there, and mids are articulate. If you need it for non-critical listening and background music, you will be happy with the sound. The lights are really cool and that’s the part we like the most. Whenever you press the light switch (whenever you turn on or off the light) you will hear quite annoying and loud beeping sound. There is no beeping sound if you turn on/off the lights with the remote. The app is not included. You have to use the remote to control the lights and activate lighting modes. You can use the remote to control the playback, too. The light bulb speaker is slightly bigger than a regular LED light bulb and it might be too big for your lamp (the problem is the body of the light bulb, not the screw base). You can’t pair two or more light bulb speakers with one phone and stream the music simultaneously to all the speakers. On the positive side, you can use one remote to control multiple light bulbs (choose the color or the lighting mode). MagicLight Bluetooth speaker bulb reminds us of previously mentioned ICOCO but it’s actually different. The less important difference is the design of the mesh. Behind the mesh, you will see the same 3W speaker. 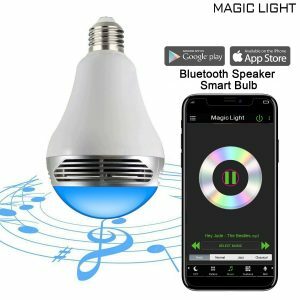 There is one really important difference – this light bulb speaker is controlled with MagicLight BT app which offers so much more than a remote. You’ll get more colors and some nice additional features. MagicLight Bluetooth speaker bulb is a little bit more expensive but it’s still affordable. You can have it for less than $35. MagicLight speaker bulb comes in a nice little box with the user manual. There is no remote but you can download the app and control everything with it. It’s actually more convenient option since we all have smartphones nowadays. The diameter of the light bulb is 2.9 inches and it’s 5.5 inches long. Size of the light bulb might be an issue if your lampshade is too small. The bulb features E27 screw base and it’s compatible with E26 light bulb socket. The combined power of the lightbulb is 9W (6W for the light and 3W for the speaker). The frequency response is pretty much standard for all 3W light bulb speakers and it spans from 135Hz to 15kHz. 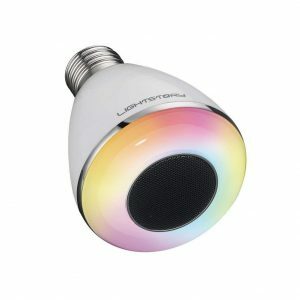 MagicLight doesn’t look different from other light bulb speakers and it resembles ICOCO light bulb speaker. The bottom part is illuminated and above that illuminated part, there’s the aluminum mesh covering the speaker. MagicLight is made of some kind of plastic. The estimated lifespan is 20,000 hours (approx. 2 years). The app that comes with this light bulb speaker offers much more control than a remote. When you install the MagicLight BT app, you can choose one of 16 million colors. The maximum color temperature of the white light is 6,500K. You can also use the app to adjust the brightness, choose one of many lighting modes or even make your own customized lighting modes. With this app, you can also link multiple light bulbs and control them simultaneously (sync them). The maximum number of light bulbs in a group is 4 (Android devices) or 5 (Apple devices). The app allows you to set timers, program the lights to turn on at a certain moment, adjust your wakeup and sleep timers, etc. In order to use this app, you will need a phone with an Android 4.3 version (or newer) or an iPhone with an iOS version that supports Bluetooth 4.0. The light bulb features Bluetooth 4.0 and Bluetooth 2.1. Yes, it’s confusing, but that’s the info from the user manual. Bluetooth 4.0 is used for lights and Bluetooth 2.1 is used for the speaker. The connection is stable and we haven’t experienced any signal loss. The pairing is simple but it’s not ordinary. After you turn on the Bluetooth, you don’t have to search for available Bluetooth devices. You just have to install and run the app, and it will find your light bulb or multiple light bulbs and you can use the app to adjust everything – group the light bulbs, adjust the volume, control the playback, etc. The sound is the thing that remains the same. It’s still tiny and shallow but it can be much louder since you can group up to 4 or 5 speakers together. The bass is weak, the mids are pleasant and articulate, and highs are dull. MagicLight Bluetooth speaker bulb is a bit larger than a regular LED light bulb and it might be too big for your lamp (lampshade). The lights don’t really sync with the music. They flash but they don’t really follow the beat. This one looks like previously mentioned MagicLight and ICOCO light bulb speakers but it’s less fun. Fluxx2122 has only one color (warm white) and you won’t be able to choose different colors and lighting modes. It’s also a little bit more expensive than some cheaper color-changing light bulbs. When it comes to speaker part, Fluxx2122 does what it supposed to do and nothing more than that. Don’t be confused with that A19 designation. Just like the other light bulb speakers, this one is compatible with the most common E26 light bulb socket and A19 implies that it’s a pear-shaped light bulb (A stands for pear-shaped) with a 19/8 of an inch diameter. If you don’t care about the colors and you want just a regular light bulb that can play music, you could be happy with this one. We honestly think that those offering more colors are also more fun. Fluxx2122 comes in a simple box along with user manual. No remote and no app. The diameter of the light bulb is 3.15 inches (which doesn’t comply with A19 designation and it’s kind of confusing) and its length is 5.5 inches. It features regular E26 screw base. The total power output of the light bulb speaker is 9W (6W lights + 3W speaker). The frequency response, like in all the previous reviews, spans from 135Hz to 15kHz. Fluxx2122 looks like a slightly enlarged light bulb and it’s similar to MagicLight and ICOCO light bulb speakers. Only the bottom end is illuminated (or the top end, depending on the way you look at it). Like all the previous light bulbs, Flux2122 is made from plastic. The estimated lifespan of the light bulb is 20,000 hours which means approximately 2 years. The light bulb has only one color and it’s warm white (3,000K and 350lm). It features Bluetooth 3.0 with up to 25ft Bluetooth range. The pairing is simple and very fast. The only thing you can control is the playback and you have to use your phone to do that. The light bulb speaker is compatible with all Android and Apple devices. The older version of the Fluxx2122 was making an annoying beeping sound when you turn on/off the light but this new one doesn’t make any sound. You won’t be amazed by the sound quality – the sound is tiny and weak. The bass and highs are poor and the only thing that’s actually good is the mid-end reproduction. The speaker can be quite loud but the sound gets really muffled at high volumes and we don’t recommend cranking up the volume. You don’t get to choose different colors and the only color you get is the warm white. You can’t adjust the brightness or change the lighting mode. It doesn’t come with the remote and there is no app so you can’t group multiple light bulbs, sync them with your music, or do anything else. It’s just a regular warm white light bulb that plays music. Even though they say it’s an A19 light bulb it’s actually wider than that and it might not fit all of your lamps if the lampshade is too narrow. The problem is not the screw base (regular E26 base) but the size of the body of the light bulb. You can’t pair multiple light bulbs with one phone and stream the music to all of them simultaneously. At first sight, Demetory light bulb speaker looks much better than any speaker we’ve reviewed previously and it is better in terms of functionality. This one comes with the remote but you can also download the app by scanning the QR code on the box and use the app to control everything. When it comes to sound, Demetory speaker is not amazing since it features standard 3W speaker but the speaker uses Bluetooth 4.0 which makes the sound just a little bit better. So, if you are not happy with the previous choices, you might be happy with this one. It’s a little bit more expensive (approx. $30) but it’s more expensive for a reason. The light bulb speaker comes in a nice box along with user manual and remote. There’s the QR code on the box that you can scan and install the app automatically. The light bulb is 5.5 inches long and its diameter is 3.35 inches. It looks smaller than that in the pictures but it’s not really small. The light bulb has E27 screw base and it can be screwed into E26 light bulb socket which is the most common one in the US. The total power output of the light bulb speaker is 7.5W (4.5W for the lights and 3W for the speaker). Demetory light bulb speaker looks different than previously mentioned speakers since it’s not pear-shaped. It looks more like a bell. The light bulb has a much shorter lifespan than previously reviewed light bulbs (but we can’t be sure that those with 50,000 hours lifespan really last that long and it seems impossible considering their price). The estimated lifespan of this one is 3,000 hours. When it comes to functionality, Demetory is definitely much better than all the previous speakers. It comes with the remote but you can also install the app and use it to control everything (lights and playback). You can choose one of 16 million colors (there are 7 basic colors) or you can use regular warm white light (approx. 3,000K color temperature and 400-450lm brightness). You can use the app or the remote to choose one of 5 available lighting modes (pulse, rainbow, flash, normal, and music rhythm) or you can make your own lighting mode. You can also use them to dim the lights, turn on/off the speaker or the lights, control the playback, adjust the volume, group multiple light bulbs together and control them simultaneously. The speaker features Bluetooth 4.0 with 30ft Bluetooth range and simple pairing process. If you decide to install the app, you don’t have to pair your Bluetooth-enabled device with the speaker (don’t have to find the speaker in the list of available devices and tap pair). You just have to enable Bluetooth on your phone and open the app. The pairing will be done automatically. The Demetory speaker delivers slightly better sound than the previous speakers but the improvement is not really that significant. After all, you can’t expect some small and affordable multipurpose device to deliver big sound. It’s still tiny and shallow but it’s more than we have expected and it’s satisfying for the size and price. The app has some glitches and it should be improved. For example, the music stops when you open the app. It’s not such a big issue – you just have to press the play button again but it can be annoying. The speaker looks smaller in the pictures but it’s not really that small and it might be too big for some types of ceiling fixtures. Texsens looks exactly the same as RAYWAY light bulb speaker and they are also very similar (almost identical) when it comes to functionality. So, we are going to make it as short as possible and just list all the important upsides and downsides. The speaker comes in a simple box. Beside the speaker, you will get the user manual and the remote. There is no phone app and you have to use the remote to control the lights. The diameter of the light bulb is 3.74 inches and it’s 4.92 inches long. It has E27 screw base and it can be used with any regular E26 socket. The total output power is 12W – 6W white light + 3W RGB lights + 3W speaker. Texsens looks like a regular light bulb, it’s just a little bit bulkier. The speaker is located at the bottom and there’s the illuminated ring around the speaker. It’s made of plastic and the estimated lifespan is 50,000 hours (which seems unlikely considering the price). With Texsens light bulb speaker, you can choose one of 12 RGB colors + white light. The manufacturer claims that the color temperature goes up to 6,300K (400lm brightness) which doesn’t seem right since the white light is not that bright. You can use the remote that comes with the speaker to choose the color of the lights or to choose one of 4 lighting modes (strobe, flash, fade, and music lights). You can also adjust the brightness, turn on/off the light (but not the speaker), control the playback (play/pause/skip), and adjust the volume. Texsens light bulb speaker uses Bluetooth 3.0 with up to 25ft range. There is nothing out of the ordinary when it comes to pairing – it’s simple and fast but, for some reason, it takes longer if you use an iPhone. The sound is really small and unimpressive. The bass is probably the biggest issue – there is practically no low-end. The mids are articulate and pleasant but only at moderate volumes. Distortion appears at 60 or 70%, and if you crank it up even more it will become really muffled. There is no app (the advertisement is kind of misleading and it will make you think that you can control the light bulb with your phone). You have to use the remote if you want to control the lights and you can use either your phone or the remote to control the playback. The size of the speaker might be an issue in some situations – it could be too big for some types of lamps and ceiling fixtures. The ‘’music lights’’ lighting mode is supposed to sync the lights with the music but the lights actually just flash randomly. It’s not possible to pair your phone with multiple light bulbs and stream the music to all of them at the same time. You can only control multiple light bulbs with one remote (you can control the lights and not the playback). Sengled Solo is the first light bulb speaker on the list that actually offers significant improvement when it comes to sound quality but the functionality of the light bulb (functionality of the app) is problematic. Sengled Solo is the first one that uses speakers made by some renowned audio company. Every Sengled Solo has 2 built-in 3W speakers made by JBL. The light bulb speaker can be controlled with an app (Sengled Pulse app) which is another plus. The speaker is slightly more expensive than the previous speakers but it’s still affordable and can be yours for less than $30. Sengled Solo offers much better performance than previously reviewed speakers but it’s still just a light bulb with a speaker inside, so don’t raise your expectations too high. The light bulb speaker comes in a nice-looking box along with user manual and 1-year warranty card. The light bulb is slightly smaller than the previous ones – its diameter is 2.83 inches and it’s 5.49 inches long. Still, it’s bigger than regular LED bulbs and it might not fit every ceiling fixture or lamp. The light bulb has the most common E26 screw base and it’s probably compatible with the majority of light bulb sockets in your home. Inside the Sengled Pulse Solo, you will see two small 1.07-inch speakers instead of one. The total power output of this Bluetooth light bulb speaker is 12.5W – 6W speakers + 6.5W light. In terms of design, Sengled Solo looks much better than all the previous speakers. It reminds us of a small microphone. Solo seems very well-built and quite strong. The estimated lifespan of the light bulb is 25,000 hours which is more than satisfying. When it comes to the color of the light, you won’t be impressed with this one since you don’t get to choose. You’ll get only warm white light (2,700K color temperature and 550lm brightness) and that’s it. The light is not bright enough and it’s directional (only the bottom of the light bulb is illuminated). You can use the app to control the light and playback. To be honest, we are not completely happy with this app. You can use it to turn on/off the light, dim the light (set brightness) or adjust the volume. That’s pretty much it. The number of things you can do with this app is very limited. The speaker features Bluetooth 3.0 with 30ft range (without obstacles) but the connection quality is far from great and you can read about issues in the next section. Pairing is simple and quick -you just have to enable Bluetooth on your phone, install the Sengled Pulse app (or scan the QR code and you will be redirected to download page), open the app, and it will automatically find your light bulb speaker and link your phone with it. When it comes to sound quality, Sengled Pulse Solo is actually much better than all the previous speakers. Unlike previous light bulb speakers, it features two 3W speakers and it can be much louder than others. When it comes to sound quality, you can hear the improvement but don’t expect full and rich sound. The bass is still not there. The highs are decent and the mids are quite dynamic. There is a certain amount of distortion at high volumes. The app is quite annoying, actually. You can’t use it to group multiple speakers and control them together. If you want to link multiple Sengled light bulbs, you should buy Sengled Pulse (which is a successor of Sengled Solo). In our opinion, this app doesn’t offer enough. You can’t set timers or schedules and can’t control the playback. You can just turn on/off or dim the lights and adjust the volume. You don’t get to choose the color of the lights. There is only one color available and it’s warm white. The Bluetooth range is around 30ft but the connection quality is actually awful. If you are more than 15ft away from the speaker, you will definitely experience occasional signal dropout. 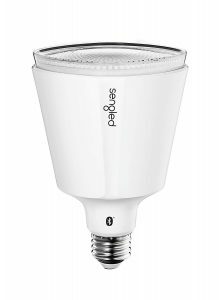 Sengled Pulse is the successor of the previous light bulb speaker on the list (Sengled Solo). It should be an improved version of Solo but we are not quite happy with the number of improvements. The most important improvement is the sound. When it comes to sound, Sengled Pulse is the best on the list and it’s our favorite (unfortunately, the sound is still tiny and mediocre). You can pair up to 8 Sengled Pulse speakers into a group and play the music on all of them at the same time. This was the second improvement. The advertised Bluetooth range of Sengled Pulse is 100ft but you will never get that much in reality and you will be happy if you get more than 30ft. In all the other aspects, Sengled Pulse is pretty much the same as Sengled Solo. This is also the most expensive light bulb speaker on the list and if you are buying it for the first time, you will have to buy at least two because one has to bit master speaker in order to group them. After that, you can buy each satellite speaker separately but you need that master speaker to group them together. The first two speakers will cost you slightly less than $100. Inside a nice little box, you will find 2 speakers (master + satellite), user manual, quick-start guide, and limited 1-year warranty. The light bulb speaker comes in three colors – pearl white, candy apple, and pewter (we are talking about the color of the aluminum shell, not about the color of the lights). The light bulb is pretty large – the diameter of the light bulb is 3.86 inches and it’s 5.43 inches long. It won’t fit perfectly all types of lamps and ceiling fixtures. The crew base is E26. The total output power of the lightbulb speaker is 21W – 13W speaker (the strongest speaker on the list) + 8W LED light. The frequency response of the speaker spans from 100Hz to 20kHz. This Bluetooth light bulb speaker is really different from others. It looks more like a Christmas bell than like a light bulb. It’s really nice and interesting. Sengled Pulse is also built differently. It’s completely made of aluminum and it looks more sturdy and durable than other light bulb speakers on the list. The estimated lifespan of the light bulb is 25,000 hours which is more than satisfying. 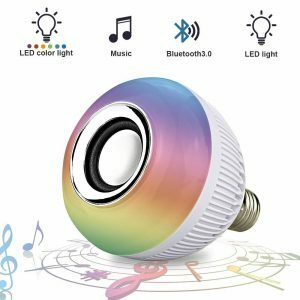 This Bluetooth light bulb speaker is not a multi-color speaker. You will get only white light and it’s warm white (2,700W color temperature). You can control the brightness of the light with the app (dimmable) but the light bulb won’t work if you have dimmer switches. The app that comes with the Sengled Pulse light bulb speaker allows you to control the volume, too. You can also adjust the EQ or set two speakers to act as left and right channels. This is where the usefulness of the app ends. It’s not really that great and it needs to be improved. You can read about some issues in the next section. Surprisingly, this lightbulb speaker features Bluetooth 2.1 (+ EDR) which is not the best choice. Your phone will communicate only with the master speaker while the master speaker uses 5GHz wireless frequency to communicate with other speakers (satellites). So, your phone needs to be close to the master speaker (within the 30ft range) and all the other speakers don’t actually communicate with your phone but with the master speaker and you can place them wherever you want. There are some issues regarding the connection quality and Bluetooth range and you can read about them in the next section. Sengled Pulse delivers the best sound out of all the speakers on the list and if the sound is the decisive factor for you, this light bulb speaker is the best choice. But don’t be too excited – this one also sounds tiny and mediocre compared to some regular or Bluetooth speaker within the same price range. The bass is really weak, while the mids and highs are pretty good. Two things we really don’t like about this speaker are the app and the Bluetooth range. The app is not that smart and it won’t remember the lights if they are turned off for more than 30 minutes. You will have to disable Bluetooth on your phone, enable it again, and then pair your phone with the master speaker in order to see all the speakers. Also, if you are out of range, the speaker won’t be automatically reconnected to your phone when you get back. You will have to repeat the pairing process. The range is much shorter than advertised and you will get 30-50ft max. This is not a multicolor light bulb speaker. You won’t be able to choose the color of the light. There is only one option – warm white light. The light is dimmable but you can dim it only with your phone. You can’t use this light bulb if you have dimmer switches installed. Sengled Pulse can be connected to only one device at a time. You can’t pair multiple Bluetooth-enabled devices with it. 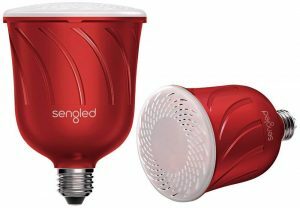 This is the last Sengled light bulb speaker and it’s the only Sengled light bulb speaker on this list that actually offers more than one color. Sengled Solo Plus Color is even better than the previous two when it comes to functionality and app but it’s not better in terms of sound. Still, this one can compete with any other multicolor Bluetooth light bulb speaker on the list. It’s not the cheapest speaker buy you will get a great fun and durability for that kind of money (approximately $50). Sengled Solo Plus Color comes in a little cardboard box. Along with the speaker, you’ll get the user manual and 1-year warranty. There is no remote but you can download the Sengled Pulse app from Google Store or App Store and use it to control the lights and playback. The speaker’s diameter is 2.6 inches and it’s 4.84 inches long. So, it’s not as big as those cheaper light bulb speakers and it features 3W driver. The output power of the speaker is 10W (7W lights + 3W speaker). The frequency response spans from 160Hz to 20kHz. Solo Plus Color is slightly smaller than other multicolored light bulb speakers on this list and it looks nicer. It’s made of plastic and looks quite sturdy. The estimated lifespan is 25,000 hours. Sengled Solo Plus Color doesn’t come with the remote but you can download the Sengled Pulse app and control the lights. You can use the app to choose one of 16 million colors and one of the pre-programmed lighting modes (rainbow filter, music lights, etc.). You can use the app to set the sleep timer, adjust the brightness or volume. The lights are not bright enough – white light is warm (550lm brightness, 2,700K color temperature). You can get much better brightness for less money and if brightness is important to you, you should look elsewhere. The speaker features Bluetooth 3.0, just like all those cheap speakers. We have actually expected something better with a greater range. The pairing is simple and quick. The Bluetooth range is 30ft. The sound quality of Solo Plus Color is slightly better than the sound quality of all those cheap speakers but it doesn’t really justify the price. The bass doesn’t exist. The mids are the only thing that really sounds good. There’s barely noticeable distortion at high volumes. The speaker can be controlled with Alexa and Echo but it will react only to turn on/off commands. You can’t change the colors with Alexa or Echo or make any advanced adjustments. You can’t link multiple bulbs together and control them simultaneously. The light bulb is actually smaller than the most of the light bulb speakers but it’s still bigger than a regular LED light bulb and it might not fit every lamp or ceiling fixture. The lights are simply not bright enough. Not only the white lights but all the lights. The app could be better. You’ll get some nice features but you won’t be able to control multiple bulbs, control the playback, pair two Bluetooth-enabled devices with one speaker, etc. LIGHTSTORY BL08A is the last one on this list of 15 best Bluetooth light bulb speakers and we have decided to end it with an affordable one but also the one that has all the important features. 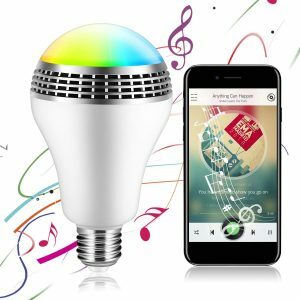 You can buy this light bulb speaker for less than $20 and it comes with a free app that you can use to control the lights and the music. 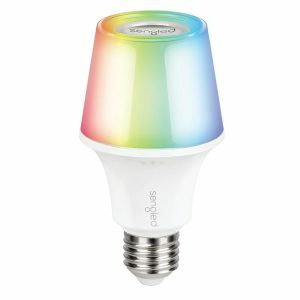 It’s not as loud as those Sengled light bulb speakers but it has multicolored LED lights and it has a much better app than Sengled lightbulbs. We haven’t found any light bulb speaker that’s actually great in every aspect and we have tried hard. So, you will have to make a compromise. If you want a better sound and you don’t care about the lights (or if you are fine with only white light), then you will be happy with one of Sengled’s light bulbs. If you really want all those colorful lights, this LIGHTSTORY BL08A is one of the best options but be prepared for mediocre sound. Based on our experience, there is no win-win situation when it comes to Bluetooth light bulb speakers. The speaker comes in a really nice packaging. Along with the speaker, you will get the user manual and 1-year limited warranty. The remote is not included and you have to install the free app to control the light bulb speaker. The diameter of the LIGHTSTORY BL08A is 2.8 inches and it’s 3.5 inches long. The light bulb features regular E26 screw base which is the most common one in the US. The output power of the light bulb speaker is 8W – 3W white LED + 3W speaker + 2W RGB LED lights. The frequency response of the speaker spans from 40Hz to 1.8kHz. That’s the info you can find on the manufacturer’s webpage but it doesn’t seem right. First of all, the speaker can’t go down to 40Hz. In fact, there is no bass at all. Second of all, that 1.8 kHz upper limit is maybe a mistake. The small speaker inside the light bulb is actually capable of reproducing much higher frequencies (probably up to 15kHz). Based on the frequency response given by the manufacturer, you can conclude that there is no treble at all but the reproduction of high-end frequencies is actually much better than the low-end reproduction. LIGHTSTORY BL08A looks like any other light bulb. It’s shaped like a bell. The speaker is at the bottom and there’s a small illuminated ring around it and that’s the only illuminated part so you can’t expect it to be enough to light up your room even if it’s a small room. But that’s the situation with every light bulb speaker on the market. LIGHTSTORY BL08A is nicely built. It’s made of plastic but it looks quite sturdy. There is no info on the estimated lifespan but you’ll get that 1-year warranty, so it should last for at least 1 year. You can choose one of 16 million available colors and 5 lighting modes (normal, pulsing, flashing, rainbow, and candle). You can also use the white light (6500K color temperature, 280lm brightness) which is not really bright. In order to control the lights, you have to install the app – you just need to scan the QR code with your phone and you will be redirected to LIGHTSTORY app download page. In order to use the app, you need an Android device with Android version 4.0 or newer or an Apple device with iOS 7.0 (or newer). The app allows you to control the playback (play/pause/skip/adjust the volume) and to sync the lights with the music. You can also use it to set timers and match certain timer with a certain light color. The light bulb speaker uses Bluetooth 4.0 with a 30ft advertised range but you will actually get 20-25ft max. The pairing process is simple – enable Bluetooth on your device, open the app, link your light bulb with the app, and you ready to go. The sound quality is mediocre. As we have already said, the bass doesn’t exist, highs are a little bit dull, and mids are the best part. There is noticeable distortion at high volumes. If you really need your light bulb speaker to sound as good as possible, then some larger Sengled speaker is a better option but if you want some multicolored light bulb speaker, the LIGHTSTORY BL08A is one of the best options. The white light is simply not bright enough and it’s not enough to light up a small room (250lm brightness). The size of the light bulb (the size of the shell) might be an issue but this is actually one of the smallest of all the light bulb speakers on this list. The LIGHTSTORY App needs to be improved, especially the timers. They are definitely useful but they can be inconsistent. We have already highlighted the most important things you should consider when buying light bulb speakers – you have to pay attention to light bulb screw base size and overall size of the light bulb, then set your budget, check connection quality, compatibility, read about different things you can do with that speaker (additional features), and check the sound quality. We are going to elaborate on each of these factors in more detail. Before you start your search, you have to know the size of the light bulb screw base that you need. This is determined by the size of your light bulb socket (on your lamp or any other lighting object). You have to match the size of the light bulb screw base to the size of the socket. Otherwise, you won’t be able to screw in the light bulb. There are four common light bulb screw base sizes (thread sizes) used in the US – E12, E17, E26, and E39 (E stands for Edison and the number is the diameter of the light bulb screw base). E26 is the most often used size in the US (most of the lamps in your home probably have this type of socket). In Europe and China, the most common sizes are E14 and E27. The E27 light bulb can be screwed in the E26 socket (they are interchangeable) and if you find a Bluetooth light bulb speaker with E27 screw base, you should know that you can use it with your lamp with E26 light bulb socket. All the Bluetooth light bulb speakers on this list have either E27 or E26 screw base. Most of the Bluetooth light bulb speakers on the market are quite affordable. The reason is simple – they are all made in China. That doesn’t mean that you won’t get the expected quality but you have to set your expectations reasonably, especially when it comes to sound quality (not because they don’t make great speakers in China but because the speakers built into light bulbs are small). The price varies from $10 to $50 for a single light bulb speaker. The more expensive light bulb speakers offer greater light bulb lifespan (20,000 hours or even 50, 000 hours), they offer more features (more colors, better apps for your phones, better functionality), and slightly better sound quality (bigger drivers). Those really cheap light bulb speakers have a shorter lifespan (up to 3,000 hours), they don’t offer advanced features (sleep and wake up timers, etc. ), and they don’t deliver equally good sound (they usually have 1W or 3W drivers). Whenever you deal with a Bluetooth-enabled device, you have to pay attention to the Bluetooth version and Bluetooth range. Those newer versions (starting from 4.0) have lower power consumption and better range (sometimes up to 50ft or 100ft but you will usually get 33ft). Older Bluetooth versions are not as good (shorter range, greater power consumption) and if you have to choose, go for those with newer Bluetooth version even if they are more expensive. 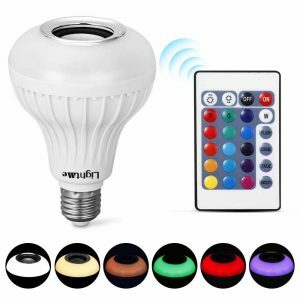 Most of these Bluetooth light bulb speakers are compatible with a wide variety of Bluetooth-enabled devices and you should be able to stream the music from any of your devices with built-in Bluetooth. But there is another thing you have to pay attention to – the app that you have to install on your phone in order to control the lights might not be compatible with the phone. To be more specific, the app might not be compatible with older Android or iOS versions. The standard features of a Bluetooth light bulb speaker are pretty obvious. It should be able to glow and to play music via Bluetooth connection. Most of the Bluetooth speakers have some nice additional features. They can change colors, they can be controlled with the remote, or with an app. Depending on the price, you will get more or fewer colors. With those cheaper light bulbs, you can choose one of 13 colors, while more expensive offer much greater choice (up to 16 million colors). 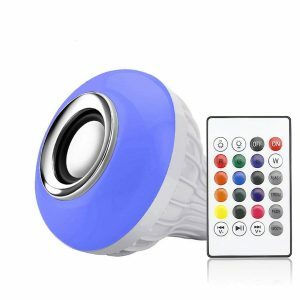 Even those really cheap light bulb speakers come with a remote that you can use to choose the color of the light, adjust the brightness, choose the lighting mode, turn on/off the light bulb, or control the audio playback and volume. 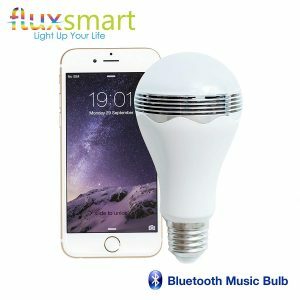 Only more expensive Bluetooth light bulb speakers come with an app that you can use to control the lights and/or the playback (you can download them from the App Store or Google Store). All the things that you can do with a remote, you can do with an app, too but there is more. You can use these apps to set all kinds of timers and customize the lights for each of these timers. You can’t expect these Bluetooth light bulb speakers to sound amazing. They can be great for their size and that’s pretty much it. They usually have 3W or 5W drivers and the sound they deliver is tiny. The low-end frequencies are simply weak or even nonexistent and highs are dull. These are all mid-centric speakers and they are not too loud. Buying a Bluetooth light bulb speaker is not such a big investment but it can bring a lot of fun to your life or it can be a perfect gift for your child. 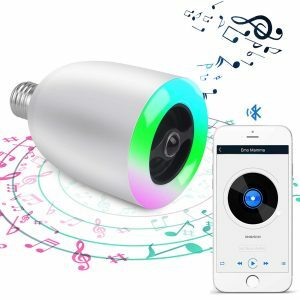 Our article on 15 best Bluetooth light bulb speakers was designed to clarify all the important things about these devices and to offer you some really nice choices. We have made an effort to test all those light bulb speakers, list their upsides and downsides, and give you a realistic evaluation. You just have to read the reviews carefully and find out everything you need to know. Hopefully, you will find something that suits your needs and budget. NextAre Volume-Limiting Headphones Safe for Your Child? That’s a tricky question and, to be quite honest, we don’t have a precise answer. The general life expectancy of an LED light bulb is 50,000 hours, which basically means that it could last for more than 13 years if used 10 hours a day (theoretically). In reality, LED light bulb could last less than a year. In my experience, LED light bulbs usually burn out after 2 years of use. To conclude, you should be happy if you get more than 2 years but don’t be surprised if it burns out after a year or so.